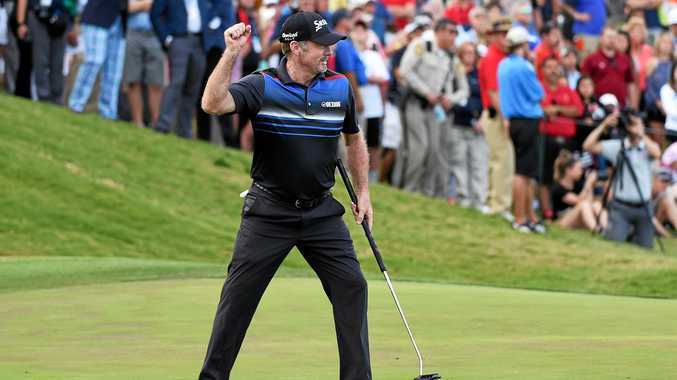 GOLF: Queenslander Rod Pampling said he was hoping to grab on to the coat tails of Jason Day and Adam Scott after winning his first US PGA Tour title in 10 years. Pampling, 47 shot a final round six-under-par 65 to complete his success at the Shriners Hospitals for Children Open in Las Vegas. The veteran, whose last win came 3885 days ago at the 2006 Bay Hill Invitational, finished on -20 after holing a monster 10 metre putt on the last - his eighth birdie of the round - to beat American Brooks Koepka by two. "That is extremely rewarding,” Pampling said after his win. "The victory at Arnold Palmer's tournament (Bay Hill) in 2006 is still the best but this is a close second. The win earns Pampling $US1,152,000 in prizemoney and also a two-year exemption on the US tour. For the past couple of seasons he has struggled to keep his tour card, alternating between the main tour and secondary web.com Tour. Pampling began the weekend with a course-record equalling an 11-under-par 60 but went into round four, one stroke behind American Lucas Glover (69), who finished third at 17 under.